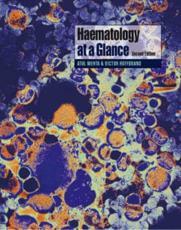 Haematology at a Glance provides a concise and accessible introduction to haematology. It follows the easy-to-use 'at a Glance' format of double-page spreads comprising clear, memorable diagrams illustrating the key facts and essential textual information. It starts with an explanation of normal blood cells and routine laboratory tests. It then reviews a wide range of blood disorders. This new edition of Haematology at a Glance: Contains full colour throughout Presents the key facts accompanied by clear diagrams, photos and images Highlights the most recent developments in the field, including coverage of transplantation technology Includes new chapters on : The side affects of drug treatment Pregnancy and neonatological aspects of haematology Practical procedures Haematology at a Glance will appeal to medical students, junior doctors on foundation programmes, haematology technicians and nursing and other health care students with an interest in haematology. Reviews of last edition "Haematology at a Glance is a valuable book for primary learning as well as for revision, and I am sure that I will refer to it for years to come." The Royal College of Pathologists Bulletin "It really is great, if you don't believe me, pick it up and look yourself,".